Kevin Durant’s 2016 decision to join the Golden State Warriors altered the NBA landscape for some time, at least until his next free agency, forming a superteam the likes of which we’ve never seen and forcing the rest of the league to raise its “risk profile” to compete. We may never be able to take complete stock of the impact made by his departure from the Oklahoma City Thunder, but we know one more ripple effect today than we did yesterday, courtesy of ESPN.com senior writer Zach Lowe. Former Cleveland Cavaliers general manager David Griffin informed Lowe that his front office met after the team’s 2016 NBA title win to “explore ways to get” Durant. This should come as no surprise to us. Everybody wanted Durant that summer. In the end, six teams secured meetings with the former MVP — the Thunder, Warriors, Boston Celtics, San Antonio Spurs, Miami Heat and Los Angeles Clippers. So, a message to Cleveland fans who routinely mock Golden State about texting Durant for help in the aftermath of the 2016 title: Your team wanted him, too, and whiffed. 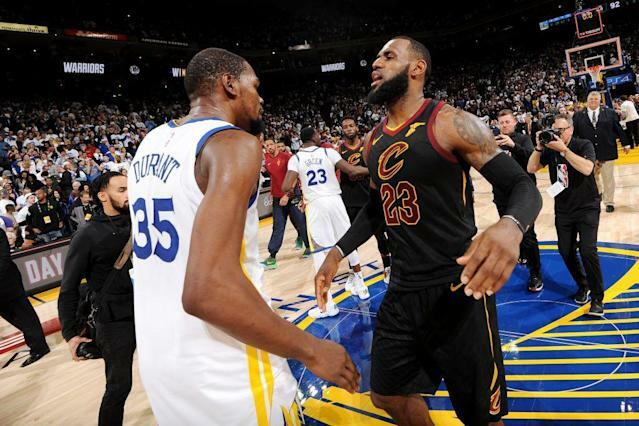 The miss on Cleveland’s part is now several fold: Would Kyrie Irving or LeBron James have left the Cavs if they had acquired their mutual friend Durant? And, in the larger what-if context Lowe explored, would James have been two rings closer to Michael Jordan had Durant joined him in Cleveland? And how much credit would we give either James or Durant for joining forces at the height of their powers? Of course, the Warriors and Cavs may not have met in the 2017 Finals if Durant had remained with a Thunder team that took Golden State to seven games in the 2016 Western Conference finals or joined a Celtics squad that made the 2017 East finals. The what-ifs are endless, not just about the resulting Finals matchups, but the complicated legacies that have resulted. Durant reportedly joined the Warriors in hopes of adding multiple titles to his résumé, which he has, and unseating James in the Best Player Alive conversation, which he didn’t — even in his own coach’s eyes. And how do we feel about James now repeatedly courting Durant? There were vaguely sourced reports that James reached out to Durant in hopes of recruiting him to the Los Angeles Lakers this past summer — reports Durant denied — and James has made no secret of his hopes that the Lakers pursue Durant this summer. It would be surprising to see Durant join James in L.A., given his comments about the “toxic environment” around LeBron. But never say never in this NBA. They have collaborated on a number of projects before, and this one would be fascinating. Jordan would never have sought a partnership with Hakeem Olajuwon, or at least that is the general perception in these debates. Of course, if Jordan had to worry about Olajuwon joining, say, the Utah Jazz of the 1990s, things might be different. The ripples in these what-ifs are many, and now we have one more to explore.